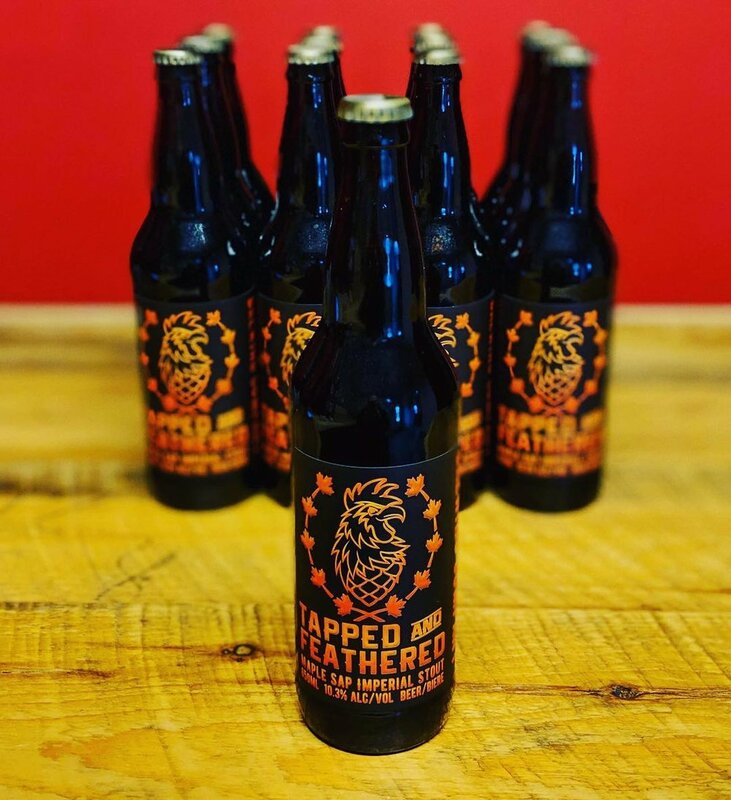 Half Cocked Brewing Company released its first bottled beer Tapped and Feathered on December 22, 2018 and it’s flavourful. With an alcohol by volume of 10.3%, the new maple batch is a warm buzz in a bottle with a hint of vanilla and chocolate flavour. The beer is a maple sap imperial stout with quality ingredients sourced from North Grant in Antigonish County. After aging in a Glenora whiskey barrel for 6 months, the beer is bottled. Sap from Haveracre maple farm in Antigonish is slightly noticeable. The beer’s vanilla flavor comes from the oak wood of the barrel used for aging. The warm feeling one gets from drinking whiskey is a unique feature of Tapped and Feathered. A bottle of 650ml sells for $17. Of the 286 bottles made, half of them are already sold. In addition to sourcing local ingredients, Half Cocked Brewing Company supports local business. Luc Boudreau is the artist from the Maritimes, creator of Maritime Grime, responsible for the top-notch label design on the Tapped and Feathered bottle. Boudreau is also the designer of the company’s logo symbolic of the family’s chicken farm that was built by Oicle’s grandfather and partners in the 1960s. Oicle’s parents bought the farm in the 1980s. As the oldest boy growing up on a farm raising 24 000 chickens, Oicle is familiar with a strong work ethic. In the summer of 1999 before he started his Geology degree at StFX, Oicle worked on building an additional barn where Half Cocked Brewing Company is now located. The bottling gear for Tapped and Feathered is provided by Big Spruce Brewing, a company from Nyanza, Nova Scotia. Big Spruce Brewing has been supporting Oicle since the early days when they delivered growlers to The Townhouse Brewpub & Eatery for sale. The business model quickly evolved and Oicle now does growler fillings and pints weekly on Thursday evenings at their location. Oicle is the head brewer and majority shareholder of Half Cocked Brewing Company. His passion for home brewing started in 2014 when Oicle and his brother experimented with recipes. Stop by the brewery on Thursdays from four to seven for excellent service and quality products at 1290 off the old Highway 245 in Antigonish.